And just like that, Christmas is over. It’s crazy how fast it passes, isn’t it? If you’ve been celebrating, I hope you had a wonderful time with your friends and family, with plenty of love, laughs and relaxation. As I mentioned last week, I spent a few days with my dad in Victoria, creating some new holiday traditions and enjoying some awesome quality time together. He moved here this past May after having been over in the Middle East since 2001 (where I lived until 2006), so it’s really nice to live in the same province and country again! As the final post of the year, I wanted to share my Top 10 Healthy Recipes of 2017, as voted by you. 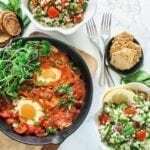 To make it into the top 10, I took a look at the most popular recipes in my archives according to Google Analytics, as well as what you guys have liked, pinned and commented on most on social media. The list is a pretty darn tasty one if I may say so myself! For those of you in need of inspiration to kick the new year off on a healthy note, you’ll find it below. In reverse order of popularity, here’s the best of the bunch. 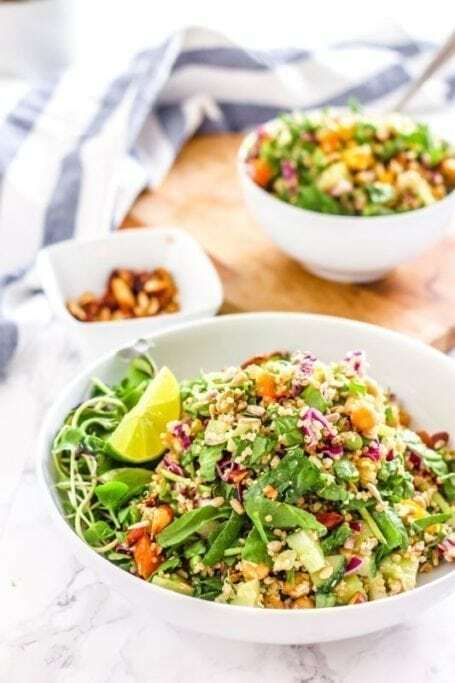 The Quinoa Trailblazer Salad is one I re-shot and re-published this year, but the recipe has been around almost as long as this blog has existed. It’s got colour, texture, mouth-watering flavour, and the maple tamari almonds (super easy to DIY!) give it an extra unexpected sweet-and-savoury crunch. 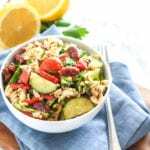 You’ll also find 6 of my best hacks for make-ahead salad success in this post. If there’s one kitchen gadget I recommend that isn’t a Vitamix, a good knife and a chopping board, it’s a spiralizer! 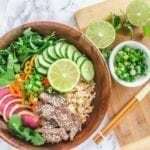 Particularly if you have a hard time getting enough veggies, are trying to cut back on starchy carbs, or want to add volume to your meals without a ton of additional calories, a spiralizer is the way to go. I have this one, which I bought back in 2012 and she’s still going strong with no signs of quitting, several hundred zucchinis later! 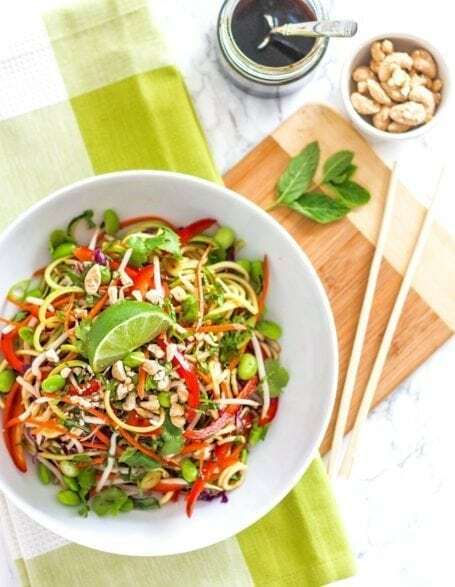 Just like the Quinoa Trailblazer Salad above, this Vegan Zucchini Noodle Pad Thai is a rainbow in a bowl, tossed in a dreamy almond butter sauce. Allergic to nuts? 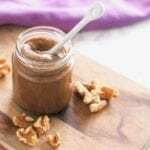 Simply swap out the almond butter for tahini and you’re all set! 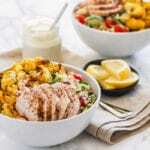 Inspired by my love of shawarmas from my years living in the Middle East, these Deconstructed Chicken Shawarma Bowls are one of my favourite examples of how to make chicken NOT boring (because I know it can seem that way after a while.) 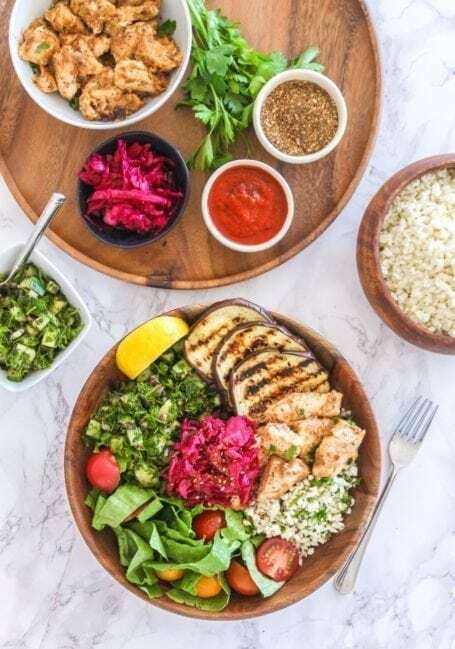 Traditional shawarmas are made with grilled meat, but don’t you worry – I don’t have a grill and the chicken is still beyond delicious when cooked in a pan on the stove. 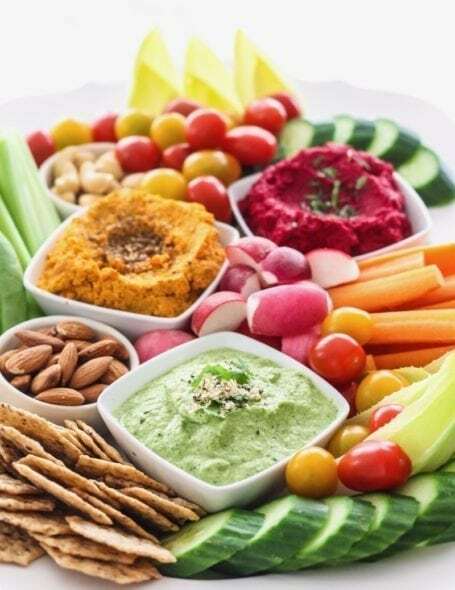 A true hummus purist might argue that hummus isn’t hummus without chickpeas, but I beg to differ – these 3 dips are all veggie-based, paleo-friendly and all have a hummus-like consistency that makes them perfect dippers for whatever your heart desires. 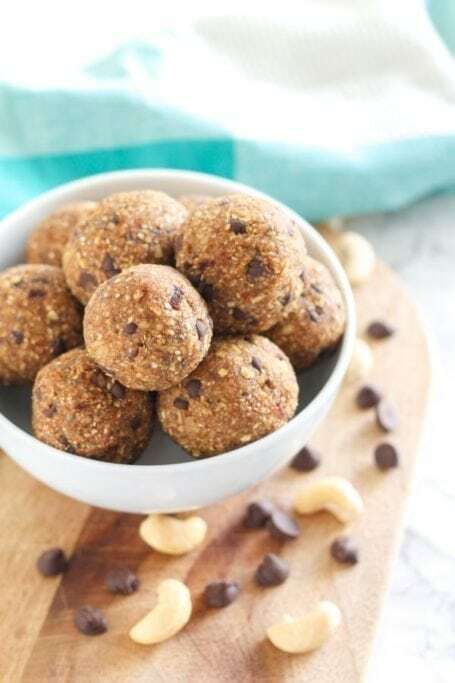 Protein bites are some of my top-pinned recipes on Pinterest, and of all the variations I’ve posted this year, the Vegan Chocolate Chip Cashew Cookie Dough Protein Bites took the win. This was also the case amongst my co-workers who sampled dozens of different flavours, so I’m pretty confident when I say that you won’t be disappointed with these! Gluten-free, travel-friendly, no-bake and awesome for satisfying a sweet tooth. 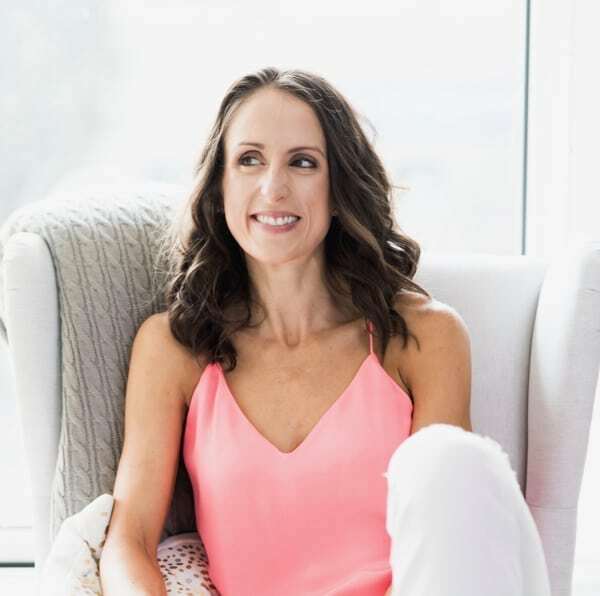 Quite possibly one of my favourite trends of the year, and one I hope will become even more mainstream, was adaptogens – specifically medicinal mushrooms, ashwagandha, maca, rhodiola and holy basil. 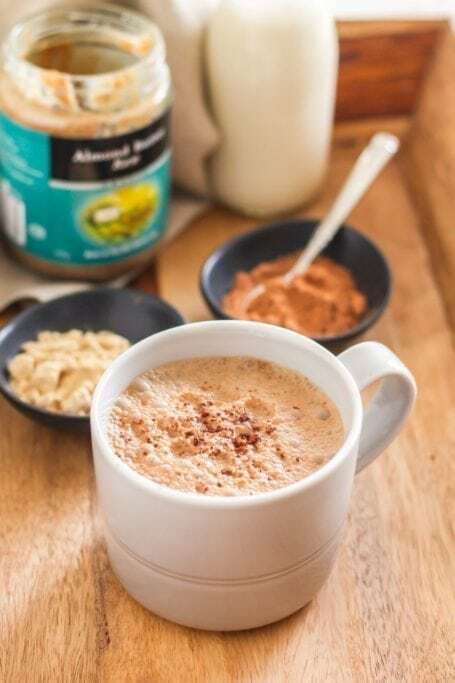 Don’t worry though – you only need two for this Stress Busting Adaptogen Latte. In addition to helping you keep your cool in stressful situations, the raw cacao mixed into the latte triggers the release of serotonin (one of our feel-happy neutrotransmitters), which means you should experience a nice little mood boost too. Perhaps fitting for this time of year after several weeks of holiday indulgences, no? 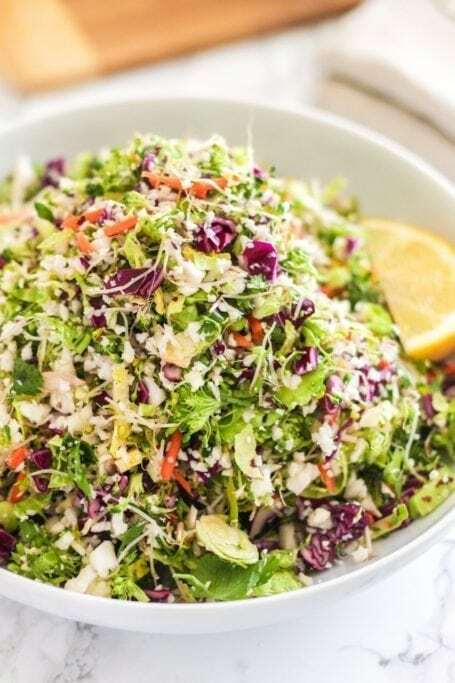 This Detox Salad with Ginger Miso Tahini Dressing is my evolved twist on Whole Foods’ classic Detox Salad, also one of the oldest and most viewed recipes on the blog. 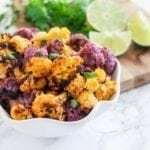 Inside you’ll find purple cabbage, broccoli and cauliflower (minced up really small in a food processor), all of which are cruciferous vegetables. They’re high in fibre which helps sweep waste along the digestive system (yay for regular digestion!) 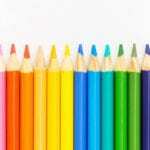 and are true multi-taskers as they support our detoxification, antioxidant, immune, inflammatory and hormonal systems. I’ve paired them with a mix of seeds, dried currants, sprouts, fresh herbs, and of course, miso tahini dressing because EVERYTHING tastes better with tahini! Probably not the kind of food you’re craving at this time in December (unless you live in Australia or some other warm and lovely place, but nevertheless, this recipe is always a crowd-pleaser. Rather than using vermicelli rice noodles (the standard in most rice paper wraps you get at Asian restaurants), I opted for spiralized zucchini in this Veggie Summer Roll recipe, along with a whole bunch of other colourful fillings. 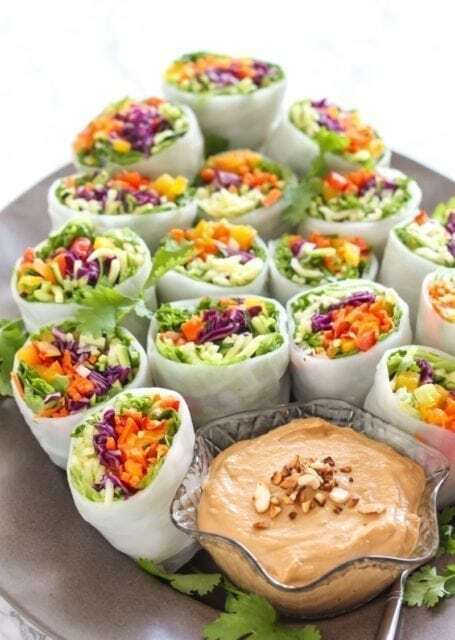 Surprisingly, these rolls actually keep well in the fridge overnight if you wrap them individually in damp paper towels and keep them in a sealed container. I could easily feast on the entire platter – they’re that good! 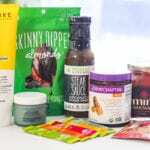 I’m starting to think this post should be called the spiralized recipe roundup of 2017, because 3 of the top 10 involve making veggie noodles! 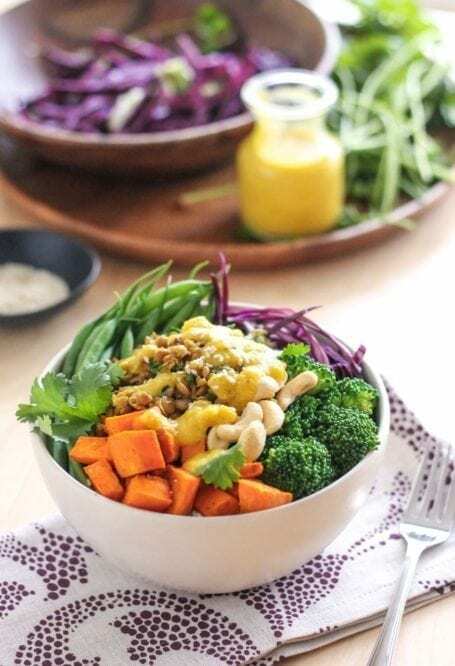 This Southwestern Sweet Potato Noodle Bowl is vegan-friendly, high in fibre (and therefore filling), and zesty with a touch of heat. 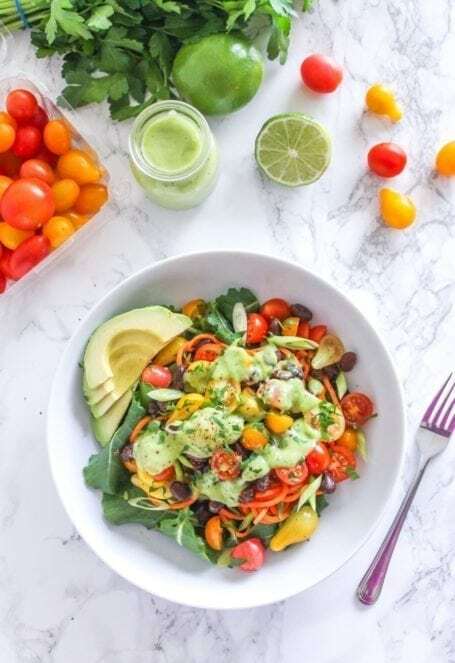 It’s made with black beans as the protein source, tomatoes, fresh herbs and a silky avocado lime sauce that you’ll want to smother all over. 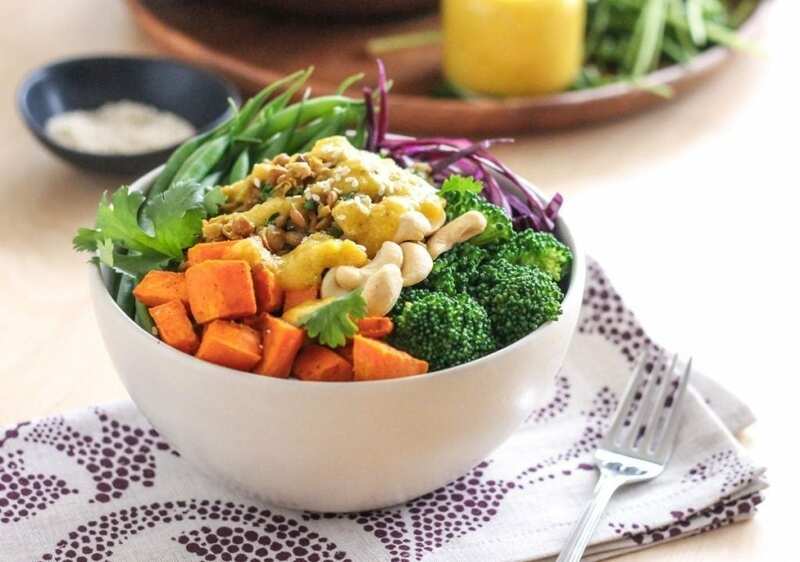 Presenting the #1-top rated recipe this year: The Bombay Buddha Bowl!! In fact, if I had to pick one of my favourite vegan recipes on the blog, this would be it. 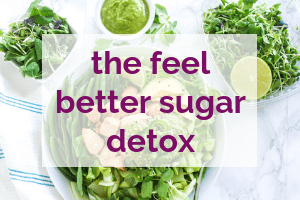 I love the combination of raw, crunchy shredded cabbage and warm, grounding sweet potatoes – ideal in colder months when our bodies crave warm foods to feel satisfied and calm. I think lentils have been a totally under-rated member of the legume family for so long, possibly because they’re not exactly the most visually exciting food when cooked. 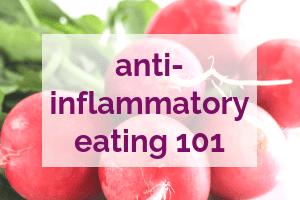 It’s a shame because they’re nutritional rockstars, packed with fibre (great for digestion and blood sugar management), plant-based protein, and micronutrients including iron – something many vegans (and women in general) fall short on. Now I’d love to know: What are the top 3 meals you ate this year? Were there any ingredients or recipe discoveries that have become new favourites?